Thayer comes from the same family tree as former favorite Taylor. And yet it remains quite rare in the US – for now. Thanks to Arianna for suggesting our Baby Name of the Day. In Latin, taliare means to cut, and a taliator was the one who did the cutting. Whisper it down the alley, thread it through French and carry it into English with the Normans, and it becomes Taylor and Thayer, too. Once upon a time, it served as a surname for those who made clothing. And while the profession still exists, it’s generally spelled tailor. The most common form of the surname – and it’s among the most familiar in the English-speaking world – is nearly always spelled with a ‘y’ – Taylor. We’re meeting plenty of children with names like Davis and Walker, Madison and Avery. So surnames make up a big part of the twenty-first century baby name pool. But it’s not every surname, and it’s not necessarily the most common ones that rise to the top. When’s the last time you met a baby called Smith or Jones? Thayer fits into this scene neatly. It’s not terribly common, but we all recognize the name. 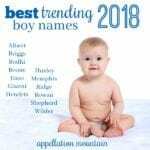 After years of Jackson, Mason, and other -n ending surnames ruling the charts, the -r enders are on the rise, with names like Hunter and Carter leading the way. 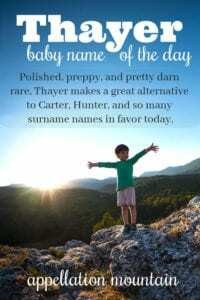 Lately, we’ve embraced the Th sound in children’s names. On the boys’ side, Theo and Theodore are the most obvious examples, along with the related Thea for girls. But Thatcher – a surname name quite close to Thayer – has also attracted attention in recent years. Maybe what this name lacks is a pop culture icon to cement it in our imaginations. After all, Taylor boasts female Swift and Lautner, along with earlier bearers from Planet of the Apes’ astronaut George Taylor – it was his last name, but he used it like a first – to 1980s dance-pop sensation Taylor Dayne. F. Scott Fitzgerald gave the name to the Monsignor in This Side of Paradise, way back in 1920. Character actor Thayer David graduated from Harvard, but might be best remembered as the crooked fight manager in the original Rocky film. It’s the surname of Ethel and Norman in On Golden Pond. In 2003 rom-com How to Lose a Guy in Ten Days, it’s the name of Matthew McConaughey’s BFF. Most recently, 2011’s The Lying Game gave the name to a character. The ABC Family series centered on twins, separated at birth, who reunite and try to untangle their family history. He’s a member of the wealthy Ryback family. You might also think of Thayer Academy, a Boston-area prep school named for its founder, General Sylvanus Thayer. He’s better known for another school he helped establish: the United States Military Academy at West Point. California gives us Mount Thayer, in the Santa Cruz Mountains near San Francisco, and a few other places dot the map. Like any surname, it’s been in sparing use over the years. 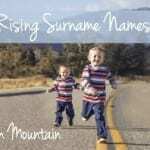 As of 2017, 46 boys received the name, along with six girls. That’s a drop in the bucket compared to Taylor. But while Taylor sounds like a 90s name, Thayer sounds fresh and just slightly unexpected. It’s polished and upper-crust, probably thanks to some of those famous – and fictional – bearers. But in our age of preppy hellraiser names, like Wilder and Hayes, that’s not a deal-breaker. 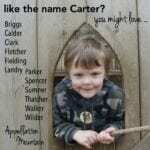 If you’re after a fits-in/stands-out name for a son, and surnames are your thing? This one belongs on your list. Would you consider Thayer for a son? Thanks so much Abby ! I am still liking this name but am not sure if it’s because I LOVE it or because I haven’t found anything I like more yet. I also read somewhere that in Teutonic Thayer means “ Nations Army”? I’m not sure if that makes me like it more or less. With my other three boys , once we picked a name , that was it, we just knew ! But with this fourth one I am just not sure! Other three are Sebastien, Nikolai and Torin. Anyone have any non top 1,000 boy name suggestions ? Ones that don’t sound too “ out there”? Thanks again!